Vincent van Gogh is a well known artist but part of the fame and legend of the man is because of the mystery surrounding the incident with his ear. It is widely believed that following an argument with fellow artist Paul Gauguin, Van Gogh returned home, and with a razor, cut off a portion of his left ear. He then took the piece of ear to a nearby brothel and gave it to a woman named Rachel to whom he said, “Guard this object carefully.” You can read more about the incident on our site, Van Gogh Gallery, here. Though many scholars believe the above explanation is as close to the reality of what occurred as we will ever know, there is no real proof to substantiate the story other than Guaugin’s own self-serving claims. This has led others to have different ideas about what might have taken place. Rather than an epileptic seizure accidentally causing him to cut his ear, or a fit a lunacy causing a madman to harm himself, others believe that perhaps the eccentric artist, Paul Gauguin is actually the culprit. 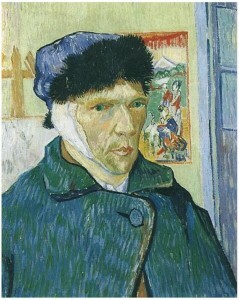 Unfortunately there is no definitive proof of what actually happened the night a portion of Van Gogh’s ear was cut off so the mystery surrounding Van Gogh and his ear lives on.